Lansing Public Library owns over 100,000 books, and subscribes to over 250 magazines and newspapers. We loan a variety of DVDs for all interests. We loan a variety of CDs for all musical tastes. We provide access to online databases for research. We provide free access to Internet service (60 minutes per day, with extensions when demand is low) and offer low cost printing solutions: 15¢ per page for black & white, 15¢ per page for color printouts. Our library has trained reference staff to help you with your research needs, whether for homework assignments, high school research assignments, college term papers, personal interest, or any other informational need. InterLibrary Loan Service provides access to materials from other libraries. The library can borrow, on your behalf, material from other libraries in Illinois and out of state. Material is delivered to Lansing Public Library for you to check out. You may request your own items from SWAN libraries! Our Readers' Advisory Service has trained staff to help you with your recreational reading needs. They can recommend a good book, provide you with a reading list, or just help you find a book on the shelf. Adult Information staff provide a full range of programming and events for adult readers including speakers, book discussion groups, reading clubs and more. Youth Services staff provide a full range of services for children from birth through grade 5, including story times, special events and Events, reading clubs and research assistance. Teen Services staff are devoted to teens in grades 6-12, and provide special events and Events, reading clubs, research assistance, and can recommend a good book! Lansing Public Library card holders enjoy reciprocal borrowing privileges at all SWAN & RAILS System libraries. Lansing Public Library was begun in 1936 when it was housed in an office provided by the telephone company in the old Lansing Bank Building with books furnished by the Works Project Administration (W.P.A.). Mrs. Chapman was the first librarian. The library was soon moved to the old Star Store where the rent was $8.00 per month. The library board frequently had to hold a fund-raiser to get enough money to pay the rent. In 1938 the library was moved to the old pump house on Chicago Avenue which was remodeled and furnished by the Village. In May 1941, the people of Lansing decided to make their library a tax supported institution, as it still is. Mrs. Frieda Brandon was appointed librarian. One of her duties was to see that the new oil stove was filled on weekends so the fire would not go out. In early 1946, Mrs. Winifred Edwards was appointed librarian. The building was cold and dark or hot and dark depending on the season, because there were no storm windows, and only brick walls. The two light fixtures were so inadequate that one needed a flashlight to find most of the books. In 1950 the building was refurbished, automatic oil heat and new windows, which opened top and bottom, were installed. In 1954, land at the corner of Ridge Road and Chicago Avenue was purchased from the Methodist Church. A referendum was held in 1956 in which the Citizens of Lansing voted to build a new building, which is now the Village Hall. When Mrs. Edwards retired in June 1966, Mrs. Joanne C. Jensen was appointed librarian. In 1967 Lansing Library joined the newly organized Suburban Library System. In 1970 it became evident that the Village needed a larger library building to house the growing collection which now numbered 25,000 volumes. When the Indiana Avenue School was torn down, the ideal piece of land became available. The present 30,000 square foot library building, named for Lewis O. Flom, the long-time Board President, was completed, and dedicated in 1976, an exciting added event in the bicentennial year. The library began circulating its books on SWAN, the library system's computer consortium. Mrs. Jensen retired in 1990, and Janice C. Bojda was hired to be Library Director. During her time at the library, the collections continued to grow, and a much needed new roof was put on the building. When Ms. Bojda resigned in 1995, the Board of Trustees Mr. William D. Babcock. Early in his tenure the library was recarpeted, the Reference Department was moved to its present location, the computerized catalog was added, and the new awnings were installed. Filtered Internet access was made available to the public in the spring of 2000. Director William D. Babcock resigned in 2006. Mrs. Deborah Albrecht was appointed as Director in June 2006. Director Albrecht has secured several grants for the library, including a grant to improve accessibility at the library. 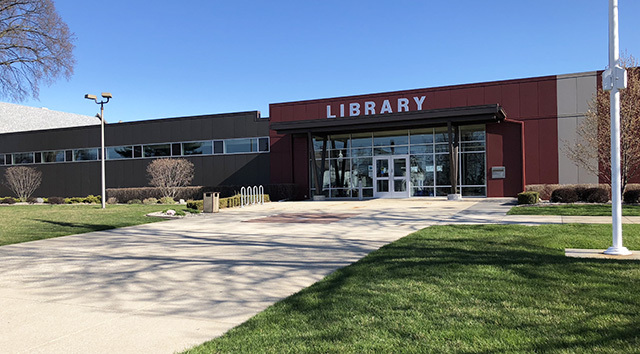 The grant funds were used to replace the Circulation Desk and Reference Desk on the upper level, and to install push-button automatic doors at both entrances. In the Fall and Winter of 2011, and Spring of 2012 the library conducted a major renovation project. All the windows in the building were replaced, the atrium was replaced, and the exterior of the building was wrapped in insulating panels. This work will ensure the existing building will last for years to come. A generous donation from the Friends of the Library paid for new landscaping. April 19, 2016, Lansing Public Library rejoined the SWAN library system. This was made possible by a grant from RAILS.